Young-looking skin is what we always desire. Wrinkles, crow’s feet, fine lines, laugh lines, and dark spots are the biggest nightmares of any woman. We can’t run away from aging, but we can delay it with these anti-aging remedies. Women in their 30s are either spending a small fortune on chemical treatments or wondering how long their anti-aging cream is going to take to give wrinkle-free skin. There are several home remedies that can help you fight aging without having to slather chemicals on your skin. Read on. The best way to deal with aging is to obtain the purest form of bee’s honey. Honey is nature’s best moisturizer, and we all know that to keep wrinkles at bay, our skin needs to be properly moisturized at all times. 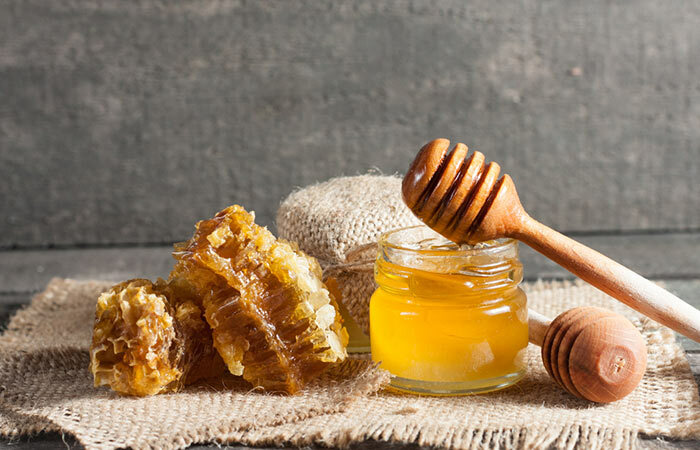 Honey also contains antioxidants that repair the damage caused by free radicals and rejuvenate the skin (1). Mix all the ingredients and apply on the face. Leave it for 15 minutes and rinse with cold water. Apply this face pack once in every three days. 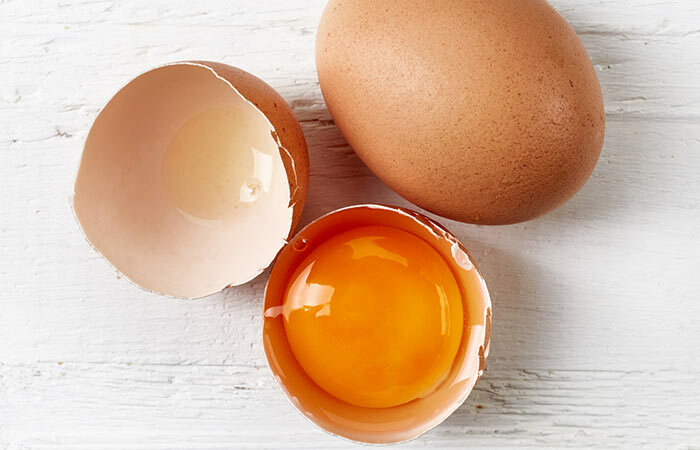 Egg white is a powerhouse of anti-aging agents like omega-3 fatty acids, proteins, and zinc. It is known to tighten the skin, making it firm and smooth (2). Boil the carrot and potato, and chop them into small pieces. Mash them to form a smooth paste. To this, add a pinch of turmeric and baking soda. Mix well with some water to obtain a smooth paste. Apply all over the face and keep for 20 minutes. Repeat this pack application twice a week. Carrots are a rich source of vitamin A, which helps in boosting the collagen production in the skin. Collagen makes the skin tight and prevents wrinkles, thus giving a youthful glow to your face (3). Potato is also considered to be an excellent anti-aging ingredient that fades away wrinkles and evens out the skin tone (4). Mix the yogurt, lemon juice, honey, and turmeric together. Carefully cut the vitamin E capsule from its tip and gently pour the oil present inside into the pack. Mix well. Leave it for 10-15 minutes and rinse off with warm water. 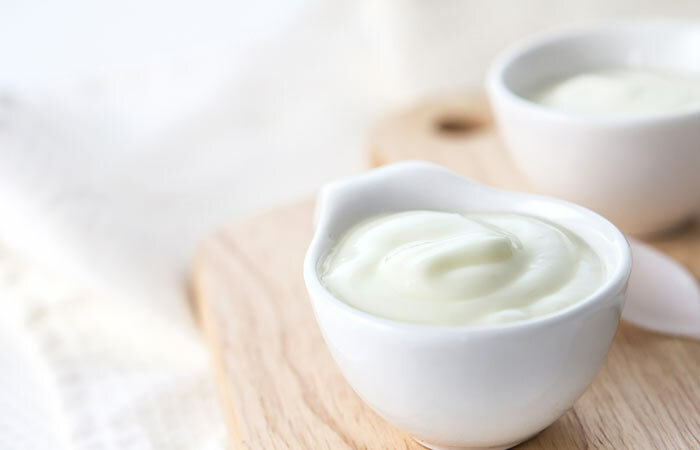 Yogurt is rich in wrinkle-preventing nutrients such as vitamins, minerals, enzymes, and fats which keep the skin fresh and hydrated. The lactic acid found in yogurt shrinks pores and tightens the skin (5, 6). Dip the cotton ball in this and apply it all over the face. This is best done every other night, before going to bed. 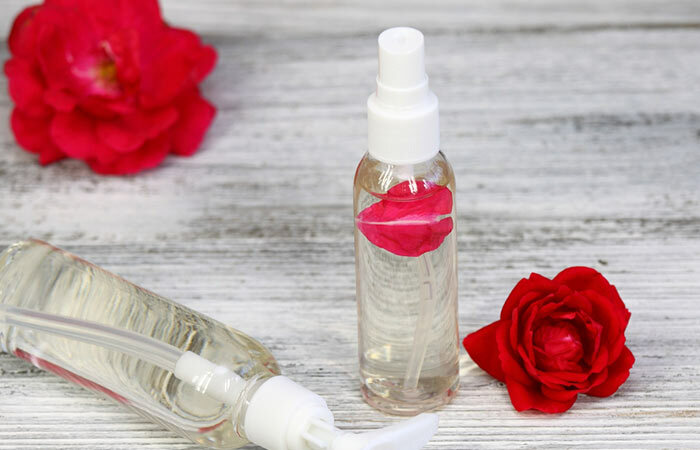 Rose water has regenerating properties and also has a calming effect on the skin. It increases the blood circulation in the capillaries and thus reduces thread veins. It also reduces blemishes and puffiness under the eyes (7). Do not wash your face after applying this pack as your face will absorb it completely. Soak the cotton ball in coconut milk and apply it over the face. After 20 minutes, rinse with cool water. This tropical fruit fights all signs of aging making your skin soft and smooth. It has antioxidants and anti-inflammatory properties which keep the wrinkles away (8). Chop and mash the banana. Add the honey and rose water to it, and mix well. Lastly, add the yogurt and mix until you get a smooth, homogenous paste. Apply this pack and keep it on for 20 minutes. Use the banana pack 1-2 times in a week. 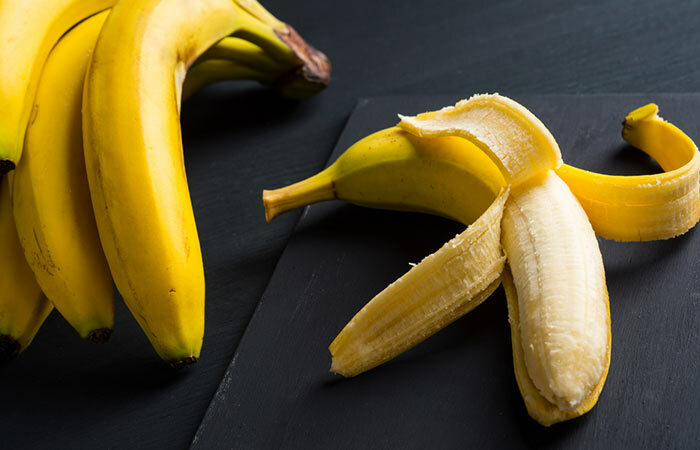 A fruit widely known for its anti-aging properties, banana contains vitamins A, B, and E. It is a rich source of zinc, potassium, and iron which is beneficial for maintaining a youthful looking skin (9). Grate the potato and squeeze the juice out of it. Soak a cotton ball in this and apply it all over the face. Leave the juice on your face for 15 minutes and then rinse with cool water. 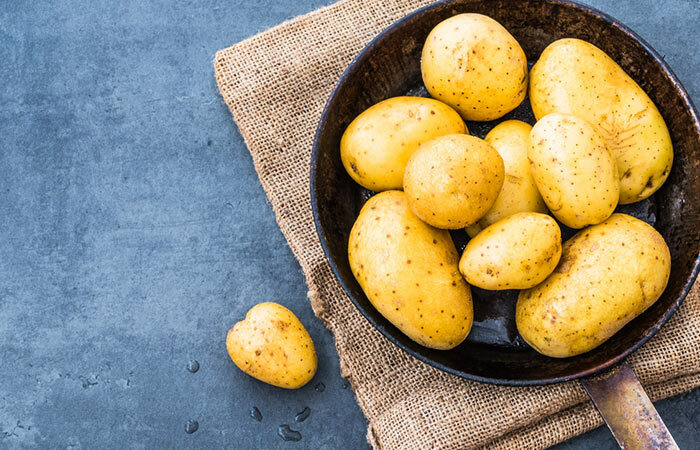 Potatoes are also a rich source of vitamin C, which helps to regenerate collagen in that has been damaged and also prevent loss of skin elasticity. Your fine lines and wrinkles will fade away with ease (10). Mash the papaya to get a smooth paste. Add some water if required. Apply it all over the face and neck. Leave it on for about 10 minutes. Rinse with warm water. Papaya face pack will give best results if used twice a week. Papaya is rich in antioxidants and contains a special enzyme called papain that exfoliates dead cells and cleanses the skin’s impurities. It also helps in regenerating new cells and provides elasticity to the skin (11). Remove the pit and grate the avocado into a paste. Use this paste as a mask on the skin for about 10-12 minutes and rinse off. You can also massage your skin with slices of chilled avocado kept in the freezer. 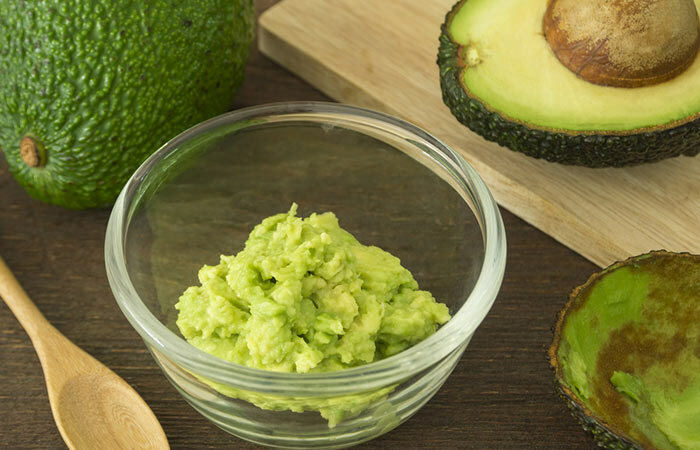 Avocados can enhance your skin radiance and diminish the fine lines and wrinkles. The carotenoids and vitamin E present in the fruit prevents the skin from free radical damage, while the vitamin C promotes collagen production making the skin firm and smooth (12). Make a blend by mixing the oils together. Massage your skin with oil in circular and upward motions for 2-3 minutes. Leave the oil blend overnight or at least for an hour before rinsing it off. Apply this every night on a cleansed face and neck. 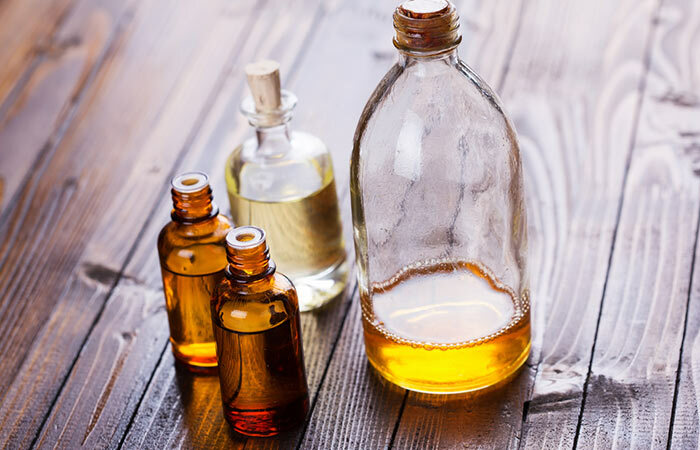 A blend of these three oils can do wonders for your skin! The natural fatty acids will act as emollients and keep the skin supple and glowing (13, 14). Rosewood oil soothes the skin and also lifts your mood with its effects on the nervous system (15). Regular use will get rid of wrinkles, fine lines as well as crow’s feet. Add enough milk to the almonds so that they are thoroughly soaked and leave it aside for the night. Grind the almonds along with same milk and apply on the face. Leave it on for 20 minutes before rinsing the pack off. Almonds are rich in vitamin E which rejuvenate and hydrate the skin. This keeps the skin in optimum health and prevents it from developing wrinkles and sagging (16). Milk prevents your skin from drying, which is one of the most common reasons for signs of aging to show on your skin (17). Apply this directly on your face and let the face pack sit for 10-12 minutes. 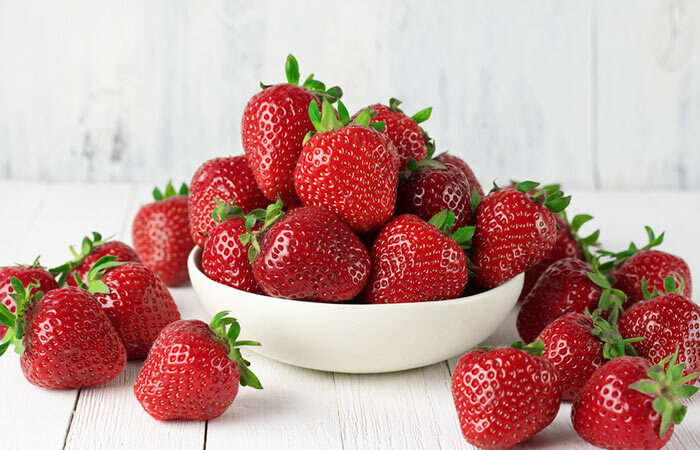 Strawberries are not just yummy but also full of antioxidants which are useful to keep aging signs at bay. Vitamin C enhances the skin’s elasticity while the other vitamins and minerals remove dead cells, even out skin tone, and brighten up the complexion (18). Age spots, fine lines, and wrinkles start to disappear with the regular use of this home remedy. Mix the sugarcane juice with turmeric powder. Apply on specific areas or the entire face for about 6-10 minutes. Rinse off first with lukewarm water and then with cold water. 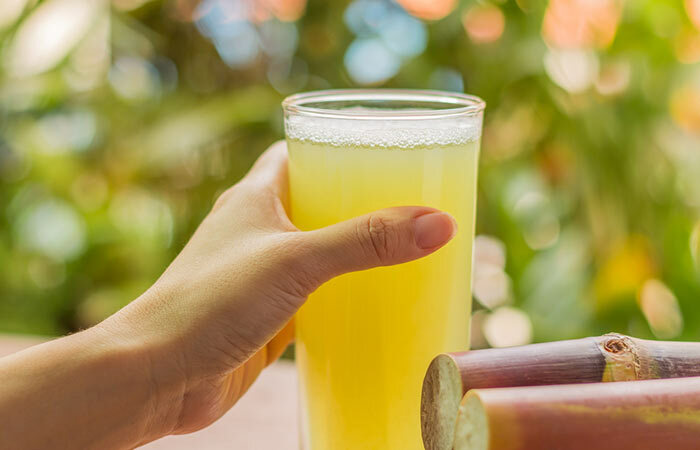 Don’t you just love having sugarcane juice during the summers? Next time bring some juice home and use it on your face for that youthful appearance. Sugarcane juice contains glycolic acid, a commonly used alpha hydroxy acid in chemical peels. It exfoliates the dull upper layer of the skin while enhancing collagen synthesis (19). Gently rub the pineapple slice on your skin for about five minutes. Leave the juice on for 10 minutes. Pineapple has phytochemicals and micronutrients which help diminish the first signs of aging. It is rich in vitamin C which promotes the optimum production of collagen in the skin. This reduces fine lines and wrinkles (20). 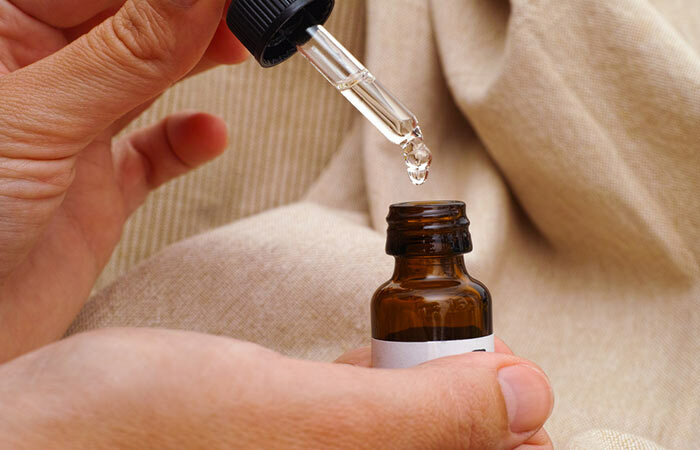 Mix all the essential oils in a clean bottle. Apply 2-3 drops of this on your skin and massage it in. Wrinkles can be effectively reduced with regular use of this effective blend of essential oils. Sandalwood oil contains omega-7 and omega-9 fatty acids which smoothen out wrinkles and treat dryness (21). Rose geranium oil exerts anti-aging effects while the jasmine essential oil hydrates aging and mature skin (22, 23). Mix all the essential oils together and store them in a clean and dry container. Apply a drop or two of this under the eyes in circular motions. Apply this essential oil blend every night, before going to bed. This oil blend contains potent essential oils that can treat dryness and wrinkles around the eyes. Regular usage will reduce puffiness and dark circles too (24, 25, 26). Do not rub vigorously because the softest and most sensitive area is the skin around the eyes. Make a paste by blending all the ingredients together. Add as much water as required to get a smooth consistency. Apply the mask and keep it on for 20 minutes. Apply a toner and moisturize the skin as usual. Marigold petals have skin nourishing and moisturizing properties (27). Rose petals also hydrate the skin with their vitamin E content. They are also excellent as a skin toner, making it firm (28). Chamomile flowers soothe the skin and make it softer (29). Take the oil in your hands and massage into the skin from neck to face. Leave it on for an hour or so. Do this every alternate day. It is best to leave the oil on overnight. If your skin is dry then you should go in for this remedy. 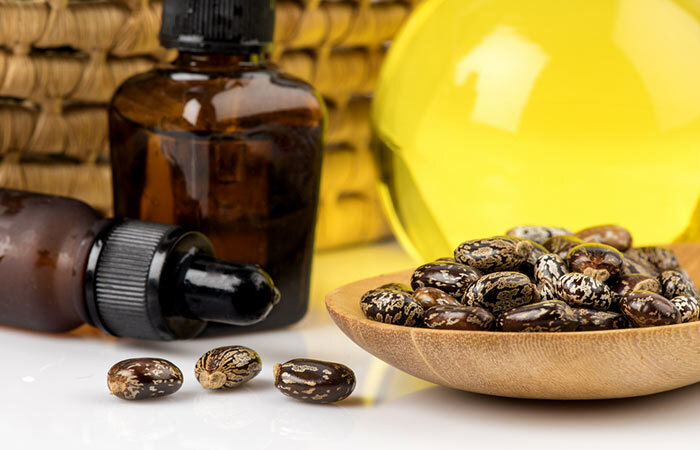 Castor oil soothes the skin and keeps it hydrated and in turn reducing the fine lines and wrinkles (30). 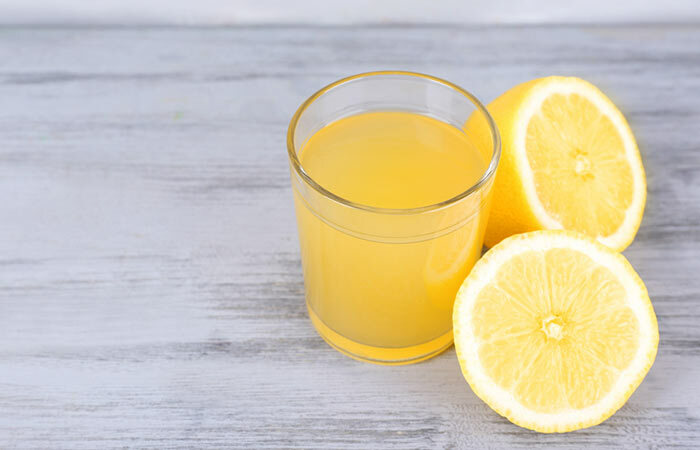 Take a few drops of pure lemon juice and apply on the areas with dark patches, blemishes, and age spots. The bleaching properties of lemons work wonders to reduce the age spots and blemishes on the skin with regular use. This is an excellent natural remedy if you want to lighten your skin and get rid of age spots and other blemishes (31). Add honey and yogurt to the amla powder and mix well. Add hot water if required to adjust the consistency of the face pack, so that it can be easily applied. Apply a thin layer on the face and neck. Let it dry for about 15 minutes before washing it off. Apply this face pack once or twice a week. As Amla is rich in anti-oxidants, it is widely used in hair care and skin care products. It boosts collagen production and prevents your skin from sagging. Caution: If any of the ingredients used in the above remedies cause reaction, discontinue using it. Shilajit is known for its remarkable anti-aging properties. It is sold in a capsule form and regular use will definitely keep you looking younger. This is another wonderful Ayurvedic medicine that rejuvenates both your mind and body. It is a mixture of as many as 40 different herbs and minerals that take weeks to prepare and complete. Chyawanprash is a part of the Ayurvedic Rasayanas. It is a mixture of herbs, minerals, and fruits that help keep the body and mind rejuvenated. If you are looking for a potent anti-aging medicine that has added health benefits, this is the one for you! Ashwagandha is one of the most powerful Rasayana remedies in Ayurveda. It is called the Indian ginseng due to its magical rejuvenating powers. The dosage of these Ayurvedic supplements is best confirmed by a Ayurvedic practitioner. Let us now look at some of the commercially available chemical treatments for aging skin. There are plenty of chemical treatments available in the market which can help us look younger. Read on to understand how these chemical treatments work. Laser anti-aging treatments help reduce fine lines, wrinkles, age spots, uneven skin tone, spider veins, and even sagging skin. They lift and tighten the skin while eliminating blemishes. Botox injections are usually targeted on specific areas to get skin that is free of wrinkles and fine lines. 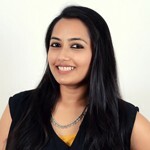 These treatments are considered non-surgical as the skin is not cut during the treatment. However, keep in mind that non-surgical does not mean pain-free, as these treatments are said to cause considerable pain and discomfort downtime. Also, they are not as appealing as the natural remedies given their exorbitant costs and plausible side effects. Here are a few tips to keep your skin looking youthful and supple. There is no better way than going natural and using safe, chemical-free solutions to give you the youthful skin you desire. 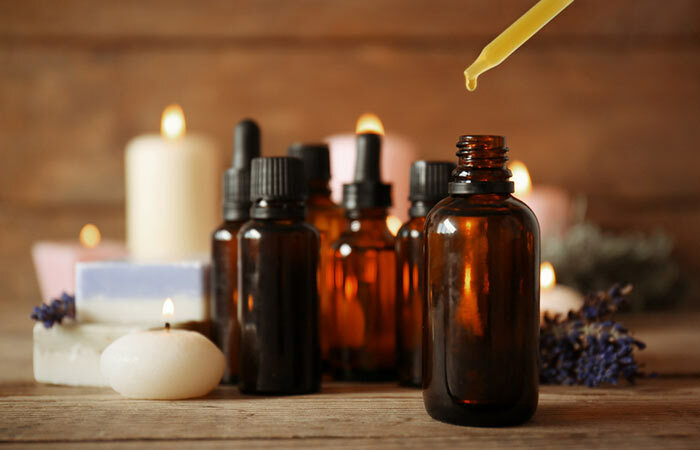 We have listed a few natural anti-aging remedies that you can use in the comfort of your home. Try them and don’t forget to share your experience with us.